Welcome to SnapBridge — Nikon’s new family of services to enrich your image experience, connecting your camera and smart device seamlessly through Bluetooth® low energy (BLE) technology. In an age when countless images are created and shared in the blink of an eye, getting the shot isn’t the end of the experience — it’s only the beginning. Imagine if that special image you’ve just created could be easily shared, at the instant it comes together with your Nikon camera and lenses. Imagine if at the very moment of capture, your family and friends could experience what you see and how you feel, via images that are rich, sharp, and full of vibrancy. Imagine if a moment that moves you could be shared among people in distant corners of the world, telling your story eloquently through the power of your images. SnapBridge lets you do all this, and more, eliminating the barrier between your camera and compatible smart device. Your breathtaking images are automatically transferred to the device as they are taken. They can even be uploaded effortlessly to cloud storage services, inviting access across all your devices. You can share your excitement, when and where you want. Imagine what happens when your images and the world have a constant connection — imagine with Nikon SnapBridge. The user interface design of this app may differ depending on the OS. The design and specifications of this app may change without notice. The updated SnapBridge app provides improved operability, which adds even more to your shooting and sharing enjoyment. When pairing for the first time, the process is guided using animation. Simpler-to-understand, easier-to-view GUI that provides intuitive operation. Power-saving mode is employed to minimize the battery consumption of the smart device. Time required for displaying images in-camera and on the smart device is greatly shortened. Remote shooting function allows control of camera settings with the smart device, including shooting mode (P/S/A/M), shutter speed, aperture, ISO sensitivity, exposure compensation, and white balance. Settings can be confirmed on the smart device live view screen. According to the situation, the accuracy of location information can be selected from three levels, including accuracy priority and power-saving priority. Easy access to Help function when needed. ■The regular SnapBridge app cannot be used with the KeyMission 360/170. Please download the exclusive SnapBridge 360/170 application. ■Available functions vary between the SnapBridge app and SnapBridge 360/170 app. ■See the App Store/Google Play for the latest information about system requirement. Camera firmware updates may be required. For information on updating firmware, visit the Download Center or view our video tutorial. For KeyMission 360/170 users, please download this exclusive application. SnapBridge allows for Bluetooth® supported connection between your camera and the compatible smart device, thus making automatic upload of your images possible. Isn’t it time to make a difference with your online pictures? Make the difference with Nikon cameras and SnapBridge. Nikon cameras and sharp NIKKOR lenses render your pictures with a rich beauty. Now with Nikon SnapBridge, your pictures are automatically transferred to your smartphones as they are taken — ready for online sharing. Impress your friends with amazing pictures that capture scenes just the way you experienced them — all with Nikon SnapBridge. The automatic picture transfer continues unaffected even when your smart device is stored in your bag or the camera is turned off. It operates uninterrupted by incoming and outgoing e-mail, syncing data with cloud services, or netsurfing. Automatic transfer can be switched on/off from the application’s Auto Link options. When automatically transferring, all images are reduced in size to 2 megapixels, which enables easy handling with your smart device. Once established, the connection between your Nikon camera and compatible smart device stays alive as long as the camera battery is installed and the two devices remain in close proximity. The good news is you don’t have to worry about excessive battery consumption in either device, thanks to Bluetooth® low energy (BLE) technology, the advanced technology that constantly connects the devices with minimal energy use. What’s more, the SnapBridge app employs a power-saving mode, which minimizes battery consumption of the smart device. Pairing the camera and your compatible smart device has become easier than ever with SnapBridge. All you need to do is to install the SnapBridge app to your smart device and register your Nikon camera with the app. That’s all. Once you have done this, a connection will be automatically established between the two devices. What’s more, this process is needed only once for each smart device, because the camera automatically detects a previously connected device on all subsequent occasions. In addition, now up to five cameras can be registered, and switching between cameras is also easy. The camera model you want to pair can be easily found. The status during image transfer can be clearly confirmed. From the day you start using the SnapBridge application, your image enjoyment will grow. Pairing steps are as simple and easy as selecting the displayed camera and following the guide instructions. Connection status and image transferring status can both be visually confirmed. The gallery on the smart device has been further refined. All images transferred from the camera, including those taken in remote shooting, are displayed in a list. Newly taken images can be easily confirmed, enabling smoother uploading to SNS. Make full use of intuitive-to-operate SnapBridge and enrich your photo life even more! Shooting mode (P/S/A/M), shutter speed, aperture, ISO sensitivity, exposure compensation, and white balance. Settings can be confirmed on the smart device live view screen. ■If your camera does not employ Wi-Fi, remote shooting and movie transferring are not available. ■Camera settings can be controlled only with digital SLR cameras. Embedding credit information (e.g. copyright, comments, text or logos) in pictures. As soon as you have connected your Nikon and smart device, register for your Nikon ID to receive unlimited online storage for taken images (2 megapixels) on NIKON IMAGE SPACE for free. This offers an option automatic upload from the SnapBridge app, providing further convenience. Nikon ID registration* automatically signs you up as a member of Nikon’s online cloud storage service. It also offers 20-GB free storage for original pictures and other large images. Nikon ID holders can easily check the shooting history of the pictures they’ve uploaded on NIKON IMAGE SPACE. 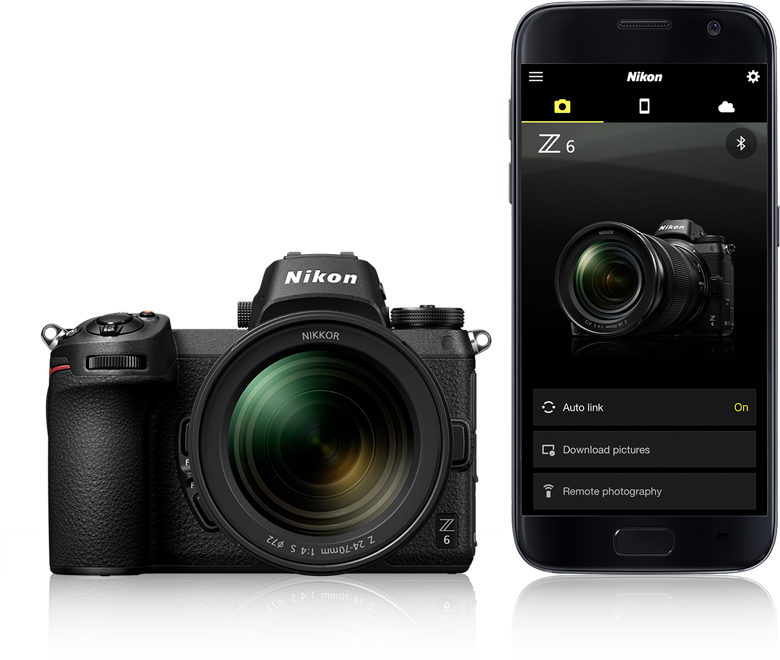 Nikon ID registration is easy, as the model name and serial number of your camera will be already entered when you first launch the SnapBridge app. So sign up and take full advantage of SnapBridge! Take advantage of automatic picture transfer by downloading the app onto your compatible smart device now. The app connects your Nikon cameras with a compatible iPhone®, iPad®, iPod touch® or smart devices running on the Android™ operating system. The app is available free from the website (snapbridge.nikon.com), Apple App Store® and Google Play™. ●Mac, OS X, Apple®, App Store®, the Apple logos, iPhone®, iPad® and iPod touch® are trademarks of Apple Inc. registered in the U.S. and/or other countries. ●Android™ and Google Play™ are trademarks of Google Inc.